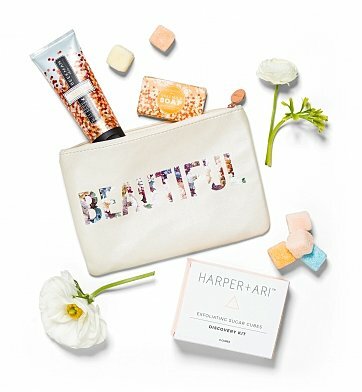 They'll nourish and pamper their skin when they receive this adorable bath and body set, contained in a durable zippered pouch that's perfect for makeup, travel and toiletries for years to come. Orange Blossom Honey Goat Milk Hand Cream & Soap. Exfoliating Sugar Bath Cubes by Harper + Ari. Your gift is securely wrapped to safeguard the shipping process and arrives presentation-ready with hand-tied ribbon. A complimentary card with your personal message is included with your gift. Beautiful Spa Bag Gift Set is a hand delivered gift. These gifts are delivered by one of our local design centers located throughout the United States and Canada. Same day delivery is available for most gifts when ordered before the cutoff time. The cutoff time for Beautiful Spa Bag Gift Set is in the recipient's time zone. With honey orange blossom goat milk hand cream, soap and exfoliating sugar cubes for the bath or shower that smell good enough to eat (but please don't! ).